Early 2007, Dawn Kaleta left her sales post in Nordstrom's intimate apparel department to seek out a vision of her own. 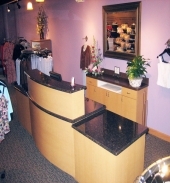 With an extensive background in lingerie and the needed experience in fit technique, Kaleta was able to open a lingerie boutique of her own-Elegance Underneath-in Naperville, Ill., by early March 2008. "I have a passion for helping customers achieve the best fit possible," she said. "Since I've opened my own place, I am able to assist people the same way I did at Nordstrom's. I like the fact that I can make someone look taller and thinner just by giving them a better-fitting bra." According to Kaleta, a well-fitting bra is the baseline of a woman's wardrobe, and slipping into the right one will make every outfit look elegant and well dressed. Kaleta recommends Natori, Chantelle and Wacoal to her broad range of customers, all who appreciate beautiful lingerie, she said. No matter the customer's age, Kaleta is able to offer a better product range by capturing customer information such as their sizes and what styles they are generally attracted to. "The trend depends entirely on the individual preference of the woman," she said. "My customer's lingerie wardrobe consists of elegant and lacy to athletic and molded cups." In addition to carrying a wide selection of bras, and the frequently requested robes and sleepwear items from brand Daddy's Favorite, Elegance Underneath carries an extensive line of mastectomy bras and prosthetics from Amoena. Kaleta has been trained by the company and is certified by the American Board for Certification of Prosthetics to fit customers, an eight-hour training that she must repeat every five years. She is one of 1,200 individuals in the U.S. to hold that honor. Visit Elegance Underneath at 2775 Show Place Drive Suite 113 in Naperville.